Marlowe, clearly cast in the hard-boiled mold of gumshoes and flatfoots originally created in the Pulps by Dashiell Hammett, brought a whole new dimension to the archetype. Tough as nails and hard to kill, Philip Marlowe was also college educated, a man of the world, and in many ways a modern day knight. This comparison is one Chandler established himself in the early pages of “The Big Sleep,” the first novel to feature Marlowe. As Marlowe enters the mansion of General Sternwood, his future client, he looks up and notices a strained glass relief of a Knight saving a distressed damsel. Marlowe comments that if he remained around long enough, “I would sooner or later have to climb up there and help him.” This identification of Marlowe as an updated errant hero wandering a dark world saving the lost and fighting off dragons not only continued throughout Chandler’s works, but remains today to be the primary way the character is described by reviewers, fans, and critics. Marlowe proved to be a game changer in terms of the Private Eye genre, largely because he did function by a chivalric, knight like code to some degree. He influenced writers and their characters, most notably Robert B. Parker’s Spenser, and still does so today. Even in the face of goons with guns, molls with malice and murder, and a city convoluted with corruption, Marlowe had rules, standards he would follow. Even if the end result meant those standards were challenged and keeping to them resulted in failure on his part, Philip Marlowe clung to what little he felt he had in the way of nobility like a knight would to his sword. This added a great amount of depth to the character and would require an actor with the skills to convey that depth, to show the complexities of a man like Marlowe fighting the evils he’d find on Los Angeles’ mean streets with just his voice. In 1948, Gerald Mohr became that man. Truly one of the most distinctive voices of old time radio, Gerald Mohr played roles up and down the spectrum. Known for the villain and heavy roles especially early in his career, Mohr’s resonant baritone lent itself well to parts that evoked mood and energy. Similarly, his screen roles, his first being a villain in the ‘Jungle Girl’ serial, and his work on Broadway in classics like ‘The Petrified Forest’ simmered and boiled with something more than just a handsome man with a silky voice. This nuance is clearly evident in “The Adventures of Philip Marlowe.” Mohr plays this titular character in detective fiction with all the edge and grit detective fans expect to hear from their heroes. But Mohr also brings the hint of Marlowe’s background as an educated man to play, not simply in the lines he reads, but in the way he turns phrases. There’s also a palpable sense of danger just under the surface. Every time Marlowe opens his mouth to question a stoolie, threaten a thug, or flummox a frail, Mohr’s delivery is such that listeners have no idea if Marlowe is going to talk or shoot his way out of whatever corner he’s willingly walking into. 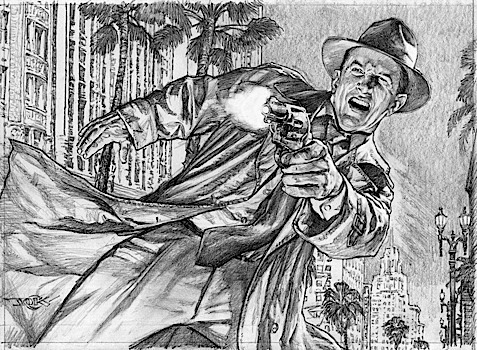 Enjoy the energy and danger that Gerald Mohr brings to The Adventures of Philip Marlowe, Volume 4! Ten episodes of Mohr at his finest, fighting his way through the clues in search of whatever justice there might be. Thrill to five hours of the best classic detective old time radio available restored to the best audio quality possible! Travel the road of crime with Gerald Mohr in The Adventures of Philip Marlowe, Volume 4 from Radio Archives! The writings of Raymond Chandler are classic for their own literary merits. Anyone familiar with 1930's and 40's Los Angeles will hear different mystery detective stories of the City of the Angels than what Hollywood might have shown in the movies although the film noir motion pictures certainly give a similar image. The interestingly written Radio adaptations generally end with a rather philosophical statement that crime does not pay and has its' own payback. The Radio Archives staff have again produced a clarity of sound that rival the Radio Shows initial broadcast if not better. The colorful and artfully packaged boxed sets come in heavy duty plastic boxes with individual sleeves for each CD and include information on each episode. The regular CD speed is used by Radio Archives versus the inferior MP3 compressed discs which definitely adds to the improved audio quality.